The waterfalls in the Bodoquena Ridge reinvigorate the warrior, who guided GRACIEMAG through one of the world’s main ecological sanctuaries. Hardly ever letting go of the tereré cup, Cyborg ordered some delicious wild pig for lunch on the side of the Transpantaneira motorway. Left, Cyborg meditates in Bonito’s clear crystal-clear water. 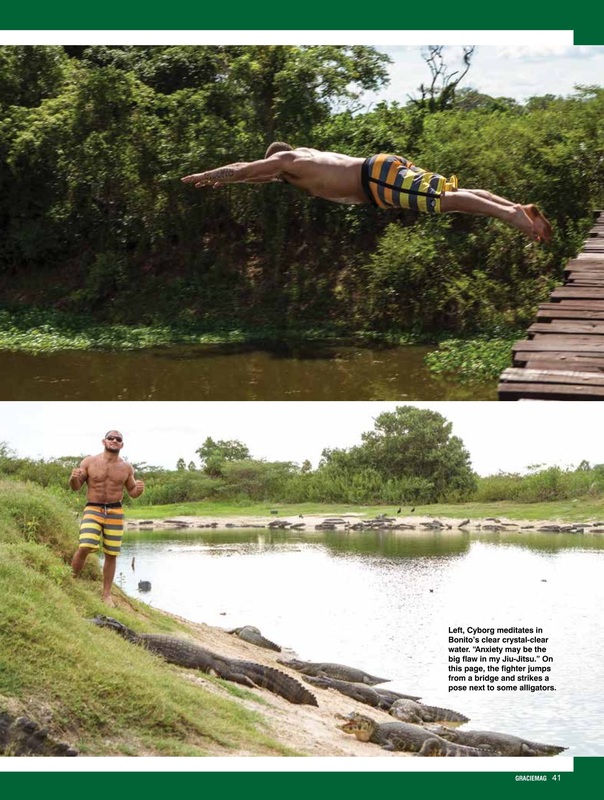 “Anxiety may be the big flaw in my Jiu-Jitsu.” On this page, the fighter jumps from a bridge and strikes a pose next to some alligators. 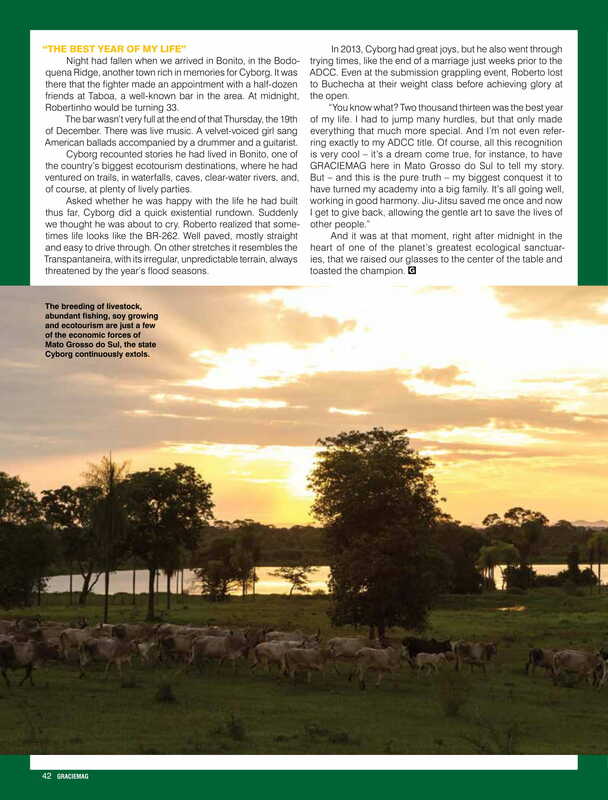 The breeding of livestock, abundant fishing, soy growing and ecotourism are just a few of the economic forces of Mato Grosso do Sul, the state Cyborg continuously extols. The signs on side of the BR-262 motorway (connecting Campo Grande, the capital of the state of Mato Grosso do Sul, to the Pantanal wetlands) warn drivers of the wild animals which eventually may cross the road. That night, however, snakes, jaguars, alligators, toucans, hawks, wild pigs, anteaters, armadillos and other inhabitants of the region seemed to be holed up. Maybe they sensed it was Roberto “Cyborg” Abreu behind the wheel of the moss-green Range Rover traveling at between 120 and 140 km/h. 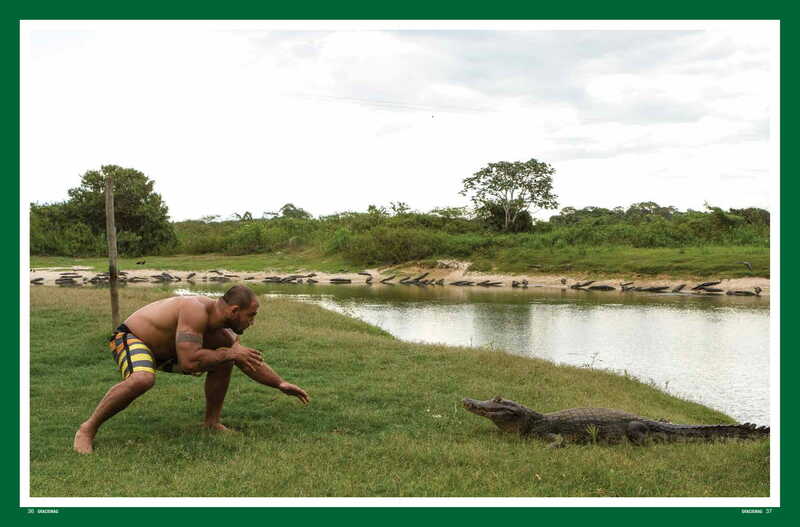 Even the most feared predator of the region would avoid crossing paths with a legitimate absolute champion of the ADCC. The exception was an unsuspecting wild cat which, as it found itself under the headlights of the Range Rover, stopped on its track, unable to decide whether to cross the road or go back. Cyborg gently slowed down and went around it. Fair play above all. In BJJ and submission grappling events, the black-belt’s reaction is quite the opposite. Cyborg always looks for the collision. He accelerates and tries to run people over, as he did in the open class of the 2013 ADCC, where he didn’t suffer a single point and got handily past such aces as Keenan Cornelius and Marcus Buchecha. 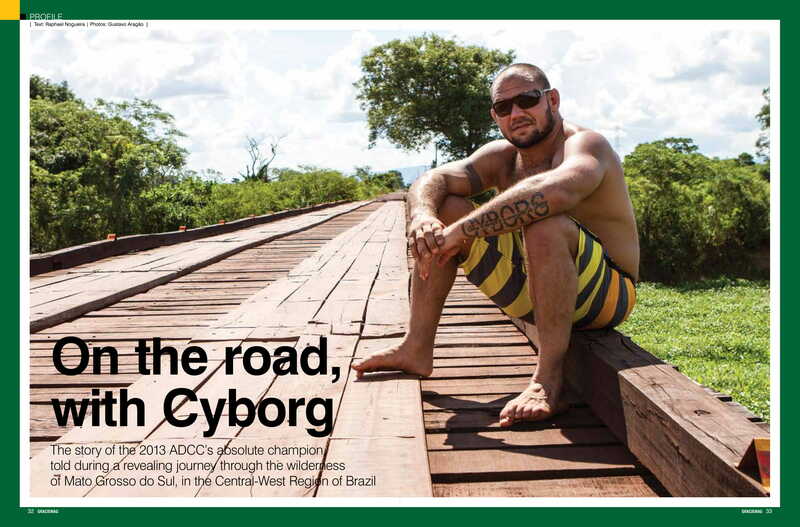 At the 2013 ADCC’s open class, Cyborg unleashed the jaguar he’d been keeping inside of him. And, as the Jiu-Jitsu community witnessed, it was hungry. It went hunting and imposed itself as a ferocious predator. The blissful mind optimized the virtues of the fighter’s improbable body. Heavy (at 105kg these days) and dense, Cyborg possesses a flexibility usually found in slender competitors, and a speed reserved for much lighter men. Chock-full of contortionism, his guard defies the laws of elasticity, while his muscles provide an uncommon mix of force and explosiveness. The champion enjoys lifting all of the weight available on gym equipment. On the leg press machine, for example, he raises over 500kg in four sets of ten. Sleep was overcoming Cyborg’s eyelids when, around two-thirty a.m., we arrived at Hotel Pantanal, near the town of Miranda, to get a little sleep before resuming the trip in the morning. Cyborg’s Jiu-Jitsu is like the convergence of several rivers of different types. At the beginning of his career he was a student of Professor Luiz Cláudio Isaías’s in Campo Grande, MS. From his intermediate phase until he got the black belt (in 2004), he was guided by Professor Francisco “Toco” Albuquerque of Nova Geração, in Rio. Whenever possible, Cyborg would travel to Rio to hone his skills at NG. But there’s one more tributary in the story, a stream of equal importance as the other two, and that is autodidacticism. “I opened Fight Sports when I was still a purple-belt. Today the school has many branches around the world and a very strong base in Miami, in the United States. A lot of my techniques and my way of teaching class were learned from the things I got right and wrong in the process of getting my gym off the ground on my own. I’ve always toiled with a lot of willpower, heart and the support of my parents and students. You bet this initiative and determination stand out in my way of fighting tournaments. My technique is, above all, a matter of attitude. The day arrived with the sun really letting us have it, which forced Cyborg to crank up the air conditioner in the car. 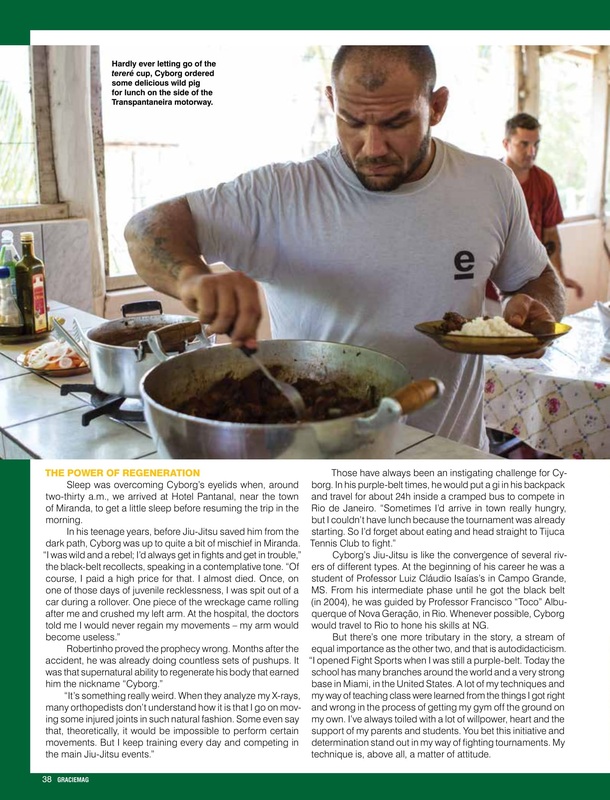 With Brazilian country music playing on the radio (notably the latest hits of duo Jorge & Mateus), the champion sucked the cold tereré herbal tea from a metal straw while he drove the Range Rover through a patch of dirt road on the Transpantaneira motorway. And down he went. He could have jumped upright, which would have been less risky, as he didn’t know the river’s depth, but he opted to jump like an Olympic swimmer. Hands in front of the head, body slicing the air horizontally. The impact sent ripples through the river, which had looked like a reflecting pool thitherto. Distracted birds flew away scared. Cyborg swam leisurely to the shore, came back up to the bridge and, dissatisfied with the picture our team had taken of the jump, repeated it twice more. 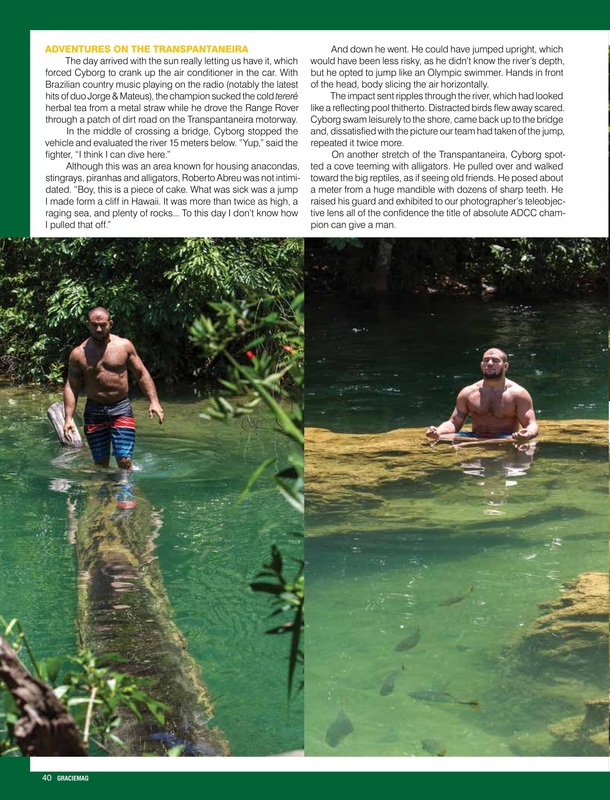 On another stretch of the Transpantaneira, Cyborg spotted a cove teeming with alligators. He pulled over and walked toward the big reptiles, as if seeing old friends. He posed about a meter from a huge mandible with dozens of sharp teeth. 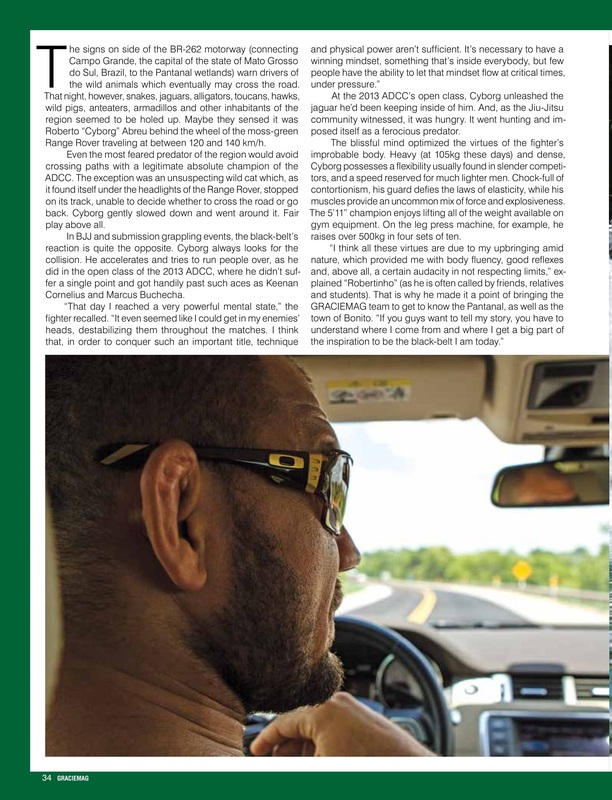 He raised his guard and exhibited to our photographer’s teleobjective lens all of the confidence the title of absolute ADCC champion can give a man. Night had fallen when we arrived in Bonito, in the Bodoquena Ridge, another town rich in memories for Cyborg. It was there that the fighter made an appointment with a half-dozen friends at Taboa, a well-known bar in the area. At midnight, Robertinho would be turning 33. The bar wasn’t very full at the end of that Thursday, the 19th of December. There was live music. A velvet-voiced girl sang American ballads accompanied by a drummer and a guitarist. 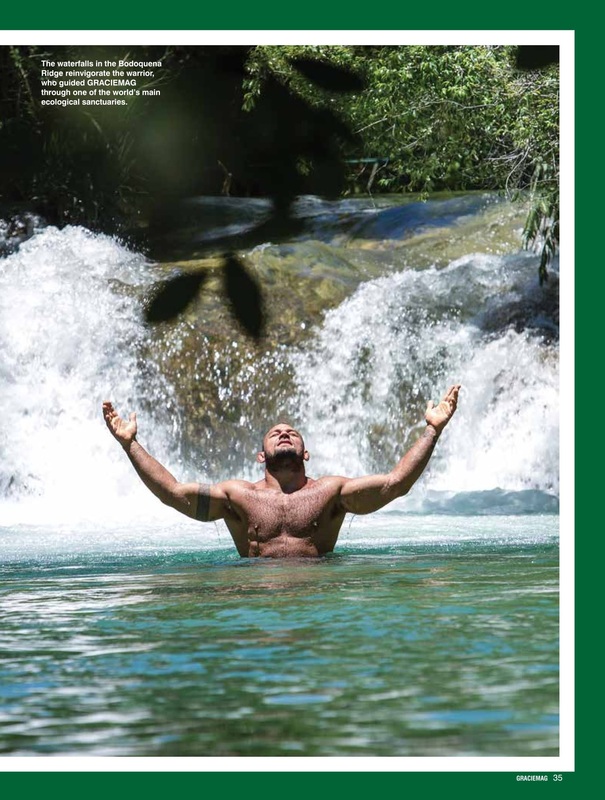 Cyborg recounted stories he had lived in Bonito, one of the country’s biggest ecotourism destinations, where he had ventured on trails, in waterfalls, caves, clear-water rivers, and, of course, at plenty of lively parties. Asked whether he was happy with the life he had built thus far, Cyborg did a quick existential rundown. Suddenly we thought he was about to cry. Roberto realized that sometimes life looks like the BR-262. Well paved, mostly straight and easy to drive through. On other stretches it resembles the Transpantaneira, with its irregular, unpredictable terrain, always threatened by the year’s flood seasons. In 2013, Cyborg had great joys, but he also went through trying times, like the end of a marriage just weeks prior to the ADCC. 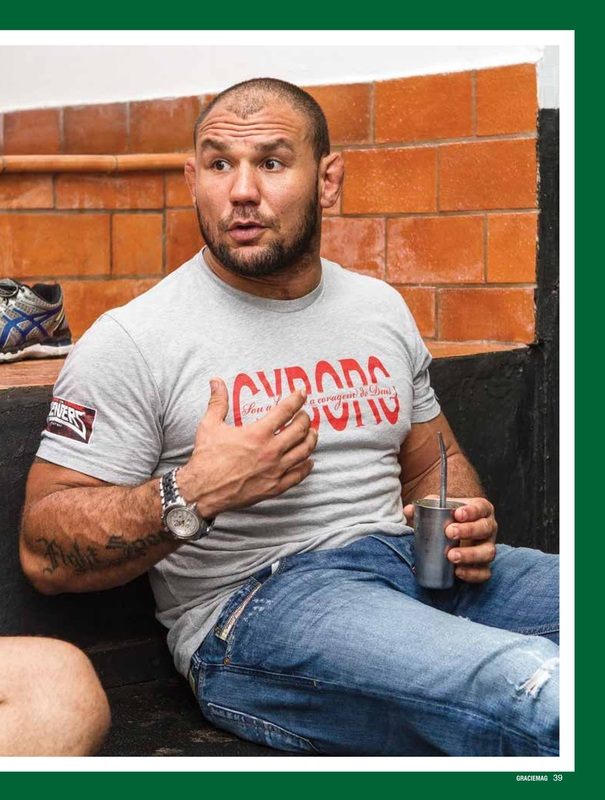 Even at the submission grappling event, Roberto lost to Buchecha at their weight class before achieving glory at the open. And it was at that moment, right after midnight in the heart of one of the planet’s greatest ecological sanctuaries, that we raised our glasses to the center of the table and toasted the champion.